TurningPoint is a Personal Response System (PRS) used to enhance classroom engagement. TurningPoint is a Personal Response System (PRS) used at the University of Plymouth. It was chosen due to its quick and easy configuration and the ability to add questions into any existing PowerPoint presentations. What is a Personal Response System? 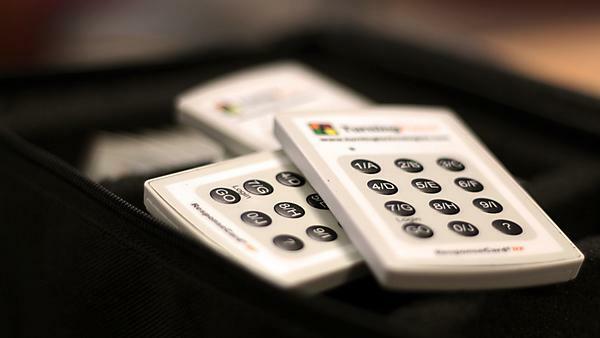 A Personal Response System (PRS), also known as Audience Response System allows you to 'ask the audience' and get them to vote or answer questions whilst attending a lecture/presentation. Within TurningPoint, the lecturer now has added functionality which enables students to vote using their own personal mobile devices. The benefits of this are that you are no longer reliant on the clickers and using this new license enables up to 500 students to poll. An added benefit using mobile devices is that students are now able use text in their responses, this gives the lecturer a greater breadth of feedback to their responses. Significant benefits can be achieved with the use of a Personal Response System. Polling anonymously allows students to respond, see the outcome of the poll, and compare their own response to the correct answer without introducing the element of peer pressure. Introducing audience participation can help create an interactive, engaging and fun learning environment. Tutors and learners get the benefit of seeing the results immediately, generating quick feedback, analysis and further discussion to clarify any misunderstood materials and concepts. The results of polls can be stored and used later for course evaluation or pre and post-testing. Some studies have suggested that the use of PRS in the classroom can improve attentiveness and even increase knowledge retention. Polls and quizzes are simple to create and deploy using TurningPoint, adding value to lectures and workshops. Meetings, conference proceedings and any other presentation activity or consultative group could also benefit from the interactivity and data gathering function of a PRS. Download our 'Interactive polling with Turningpoint' guide. Want to use TurningPoint in your teaching? If you would like to try TurningPoint or use it with your own students, then please contact Academic Support, Technology & Innovation (ASTI). ASTI currently have two TurningPoint Cloud licenses allowing up to 500 responses per license and 80 TurningPoint clickers available for testing purposes and loan. Student engagement is often gauged on observations of behaviour in the field. A show of hands rarely solicits a response from more than a minority of students.